A BBC Crime Drama starring Carey Mulligan as a detective in modern-day Britain that should give us an insight in the modern day state of the nation of the UK. It produced by BBC Two and Netflix, and will be available for streaming on Netflix outside of the UK. Where can you stream Collateral? On 2018-02-12 Drama/Crime TV Series Collateral first aired on BBC Two. 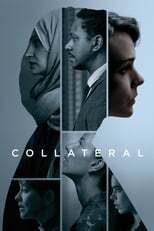 Written and created by David Hare, and produced by The Forge Entertainment Productions & Netflix, Collateral has ended and last broadcasted on 2018-03-05.